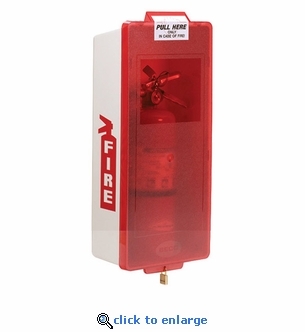 Brooks Mark II Junior Series M2JWR Fire Extinguisher Cabinets with white tub and red cover features a breakaway cover for quick and easy access to fire extinguishers in an emergency. Pull to snap cover from cabinet to retrieve fire extinguisher. No glass to break. Constructed of high-impact polystyrene and ultraviolet inhibitors, these surface mount extinguisher cabinets will not fade, regardless of the weather or environment. The M2JWR cabinet is Recommended for Indoor Use. Color: White Tub with Red Cover.